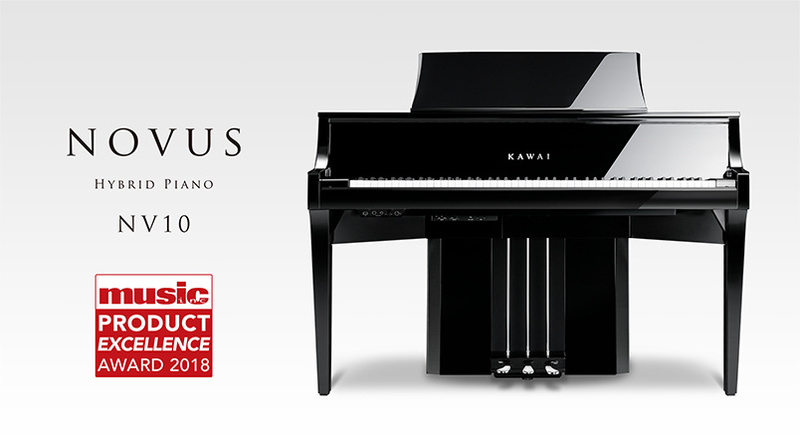 Kawai Novus NV10 wins Music Inc. magazine ‘Product Excellence’ award | News | Kawai Musical Instruments Manufacturing Co., Ltd.
Kawai is proud to announce that the Novus NV10 hybrid piano has received a prestigious ‘Product Excellence’ award from Music Inc. magazine – one of the music industry’s leading trade publications. Each year the magazine surveys musical instrument retailers across North America, inviting dealers to vote for products that have innovated and expanded the industry over the past twelve months. Winning manufacturers receive a prestigious ‘Product Excellence’ aware from Music Inc. magazine, along with the satisfaction of being honoured as one of the musical instrument industry’s finest brands and products. The Novus NV10 hybrid piano was unveiled to the public at the Frankfurt Musikmesse exhibition in Spring 2017, and officially launched the following October. This remarkable instrument combines Kawai’s finest Millennium III acoustic grand piano keyboard action, including a real damper mechanism, with the latest SK-EX Rendering piano sound engine and premium amplification technologies developed in collaboration with audio specialists Onkyo, to deliver the most realistic grand piano playing experience ever accomplished by a digital instrument. This year’s ‘Product Excellence’ award is the 12th accolade that Kawai has received from Music Inc. magazine in ten years, following previous awards for the GX-2 acoustic grand piano in 2017, and multiple awards for the popular CA and CN series digital pianos. Kawai America has also received multiple ‘Supplier Excellence’ awards, acknowledging the subsidiary’s commitment to dealer and customer satisfaction. Music Inc. magazine is North America’s leading business-to-business magazine for musical product retailers. Each issue of Music Inc. includes industry news, product information, and “ideas” columns from influential figures within the musical instrument industry. Kawai is a global corporation with distribution in virtually every major market in the world. From its beginnings in 1927 in Hamamatsu, Japan, the company has been committed to an ongoing quest to perfect the art of the piano. Since 1998, Kawai has received over 45 major international awards for product and service excellence. One of the world’s largest music instrument manufacturers, Kawai celebrates its 90th anniversary in 2017 and is one of the few piano companies in the world still led by members of its founding family.